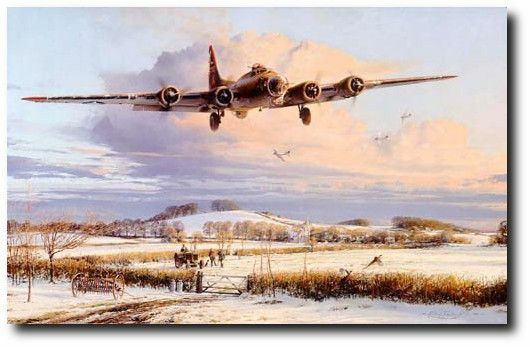 There were few sights more stirring than a B-17 Fortress on its final approach returning from a combat mission. The co-pilot, clearly visible, assists his captain with the landing - the aircraft has taken some damage from fighters and is a handful on the approach. With wheels and flaps down, engines throttled back, the skipper eases the big machine gently down the glidepath towards touchdown, amidst the peaceful countryside of East Anglia. In a few moments the last crews will be safely down as the English winter landscape welcomes home another crew.